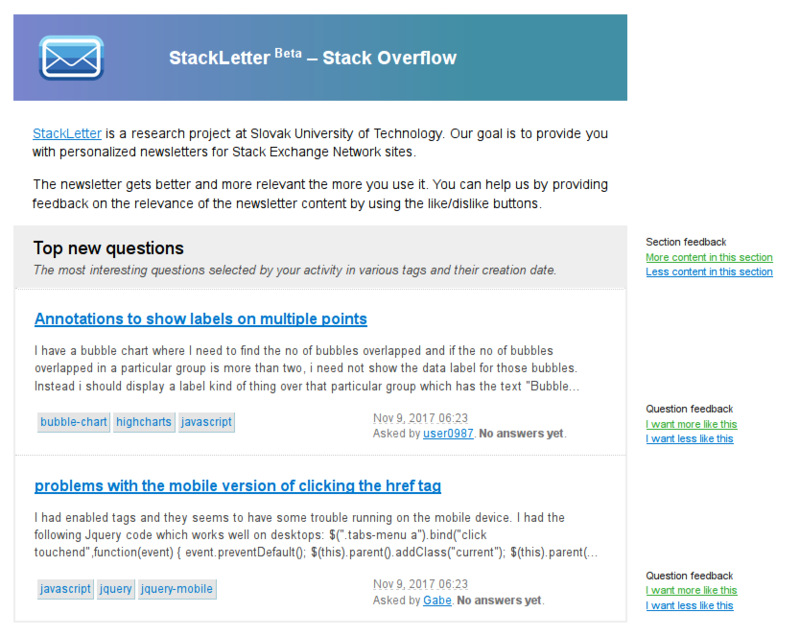 StackLetter is a research project at Slovak University of Technology. Our goal is to provide you with personalized newsletters for Stack Exchange Network sites. There are numerous posts on Meta Stack Exchange of people complaining about the state of the current newsletters, which are not interesting or personalized and often provide essentially random content. We are making the newsletter personalized for each individual user by using machine learning and recommender systems to provide you with content that is relevant to you. Additionally, we also dynamically adapt the newsletter structure based on your activity on Stack Exchange sites. By using your implicit and explicit feedback, as well as your activity, our system is constantly learning what works for you. Start using StackLetter by visiting our website - StackLetter.com. You can authorize with your Stack Exchange account and select the sites from which you wish to receive the newsletter. The authorization is needed to identify your account and setup a token for API access. We only use publicly available data and our tokens do not have access to your private data. StackLetter is a research project of Data Analysis Research Group at Faculty of Informatics and Information technology, Slovak University of Technology in Bratislava. If you have any questions or concerns, don't hesitate to contact us at info@stackletter.com. StackLetter is open-source - you can find all our code on GitHub.